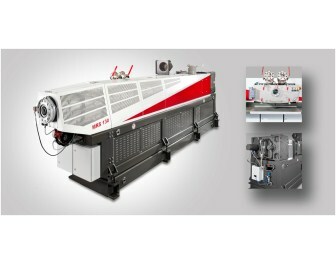 At CHINAPLAS 2013, Germany-based machinery supplier Gneuss will show its MRS extruder for the devolatilization of polymer melts, its online viscometer VIS, the range of Rotary Filtration Systems and screen changers as well as its environmentally-friendly melt temperature sensors and pressure transducers. The MRS permits the processing of PET without pre-drying or crystallizing. By providing a very large surface area and using a simple water ring vacuum system it is possible to process the material directly into a high quality product. This is achieved with a unique and patented processing section. Based on a conventional single screw extruder, the Multi Rotation Section (MRS) is a drum containing eight satellite single screws, driven by a ring gear and pinion transmission. The “barrels” cut into the drum are approximately 30% open and provide optimum exposure of the melt. As said, the devolatilizing performance is 50 times greater than that of a conventional single screw extruder, and this at a vacuum of only 25-40 mbar. By avoiding the need for a high vacuum system and pre-drying, the MRS is an economically efficient alternative to conventional technologies. Further advantages are the simple and rugged design, small footprint and flexibility. The US American Food and Drug Administration (FDA) issued a total of 4 LNOs (letter of non-objection) for the MRS extruder for reprocessing material for the food industry. The MRS extruder not only efficiently extracts water but also decontaminates the material so that up to 100% PET bottle flakes can be processed to food containers. This is achieved without the need for any treatment of the material before or after it is processed on the extruder (no restrictions on the washing process, no drying, no crystallizing etc.). Meanwhile, Gneuss’ Filtration Technology division will present its Rotary Melt Filtration Systems with further design enhancements. Several new safety features and the option for an automatic ejector for the backflush material of the RSFgenius have been added. As for the mercury-free NTXTM pressure transducers, a new sensor design is being offered specifically for food processing applications. The watertight housing holds up to typical sanitary treatments in these applications with high-pressure washers. These sensors are also used in medical applications.